Orascom Telecom reported its third quarter net profit for the nine months ended 30 September 130 percent higher from a year earlier to USD 951 million, compared with USD 413.3 million for the corresponding period last year, thanks to USD 822 million contribution recognized on the Mobinil transaction. OT said that Nine-month profit included a $300 million payment received from France Telecom as part of settling ownership dispute over Mobinil. Excluding the gain through Mobinil, third-quarter net profit from continuing operations was USD 112 million 40% down from USD 183.6 million for same period last year. Orascom Telecom’s subscriber base increased 16 percent over the same period last year, to surpass 100 million mark to reach 103.3 million customers, versus 99.1 million in June 2010. Orasom said that its revenues for the first nine months of the year reached USD 3.1 billion, up 1.6 percent over the same period of 2009 as a result of strong growth in most GSM operations, with the exception of Algeria. The 8.9 percent decrease in Algerian operator Djezzy’s revenues is said to be driven by the crisis in Q4 2009, as well as the inability to launch new promotions until the end of Q3 2010 and banning advertising on government-owned TV channels. EBITDA for the nine months was down 0.8 percent form a year ago to USD 1.33 billion. Capex fell 10.2 percent year-on-year to USD 457 million in the nine months. Mobilink, Orascom’s arm in Pakistan, reported revenues of Rs. 70.4 billion for three quarters (2010) as compared to Rs. 64.3 billion in the same preiod last year. This translates into a YoY growth of 9.6 percent. Mobilink posted revenue of PKR 23 billion for third quarter of 2010 as compared to PKR 21.5 billion for the same period last year, translating into a year on year increase of 6.27%. EBITDA increased from PKR 7.7 billion in Q3 2009 to PKR 9 billion in Q3 2010, registering an increase of 17.8%. Mobilink subscriber base showed 4.7% growth as compared to closing base of Q3 2009 closing at 31.44 million at the end of Q3 2010. Net gain was hampered by the devastating floods, said the Orascom. It said that out of the Mobilink’s 8,070 sites, more than 400 sites were affected. Along with, Mobilink’s contributed Rs. 236 million as one of the largest private sector relief initiatives for flood hit areas. 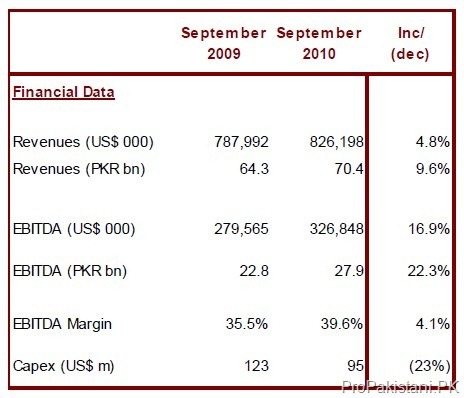 Mobilink’s operational expenditures rose to Rs. 15.3 billion, up 19 percent from Rs. 12.79 billion during the same period a year ago. Mobilink lost quarter million customers during the quarter, which the company says is a cleanup for some subscribers that were mistakenly considered active by the systems. OTH subscribers have now surpassed the 100 million mark and net income before minority interest has reached US$ 922 million for the period. Bichara highlighted the challenges faced by Pakistan due to the floods and Orascom’s contribution for the benefit of the flood victims in Pakistan. Although Mobilink is expansive and network is also not good. But their Sales revenues are good. They are playing from both end, at one end doing fake MNPs via its sales team and on other end charging Rs. 2 per call at helpline. Because they need year end BONUSES by showing growth in numbers and revenue. As above stated. “Mobilink lost quarter million customers during the quarter, which the company says is a cleanup for some subscribers that were mistakenly considered active by the systems”. Very strong rumors that Mobilink has bought Warid ! If its true then Mobilink will become undisputed King of the telco sector here while Warid employees will need to look for other jobs ! IT IS NOT THE ACHIEVEMENT OF MANAGEMENT ONLY , IT IS DUE TO THR FRANCHISES ALL OUR THE PAKISTAN, A BAD EVENT IS THAT PMCL LOOTINGB THEIR FRANCHISES AND NOT PROVIDING THEM PROPER RIGHT AND ACESS TO ALL FINANCIAL DATA, THEY ARE THEFTING THE COMISSIONS AND RETENTION OF FRANCHISES SO WHAT IS THE ACHIEVEMENT.ACHIEVMENT IS THAT IF ALL STAKE HOLDERS AND BUSINESS PARTNERS ARE HAPPY, EARNING BY FRAUD IS A CRIME. SHAME ON LOOTERS.